Red velvet cake, named for its red-brown colour, has made a big comeback since its origins during the Great Depression. It is now available at bakeries, cupcake shops, grocery stores, and restaurants. It even comes in a boxed cake mix. In the 1970s, red velvet cake was the highlight at my girlfriend’s house. As teens we repeatedly walked through the kitchen just to admire the cake on the cake stand, and each look increased our anticipation of eating a big slice after the Sunday meal. These days, however, red velvet cake is nowhere to be seen at our house. The new boss in town is pineapple upside down cake, made from my grandmother’s recipe which most likely came about with the advent of Dole’s canned pineapple from Hawaii in the 1920s. The pineapple mixed with the flavours of melted brown sugar and chopped nuts makes this cake an unbeatable taste experience. Its modernized version includes recipes tailored to an oversized or mini-sized decorative cake pan for commercial or home use. 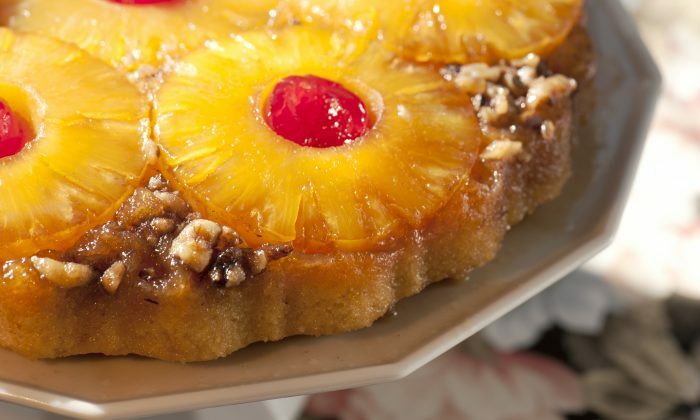 Every time I take this handsome cake to gatherings, people—particularly men—will say, “I haven’t had pineapple upside-down cake for a long time. What a treat,” as they help themselves to seconds. My mother passed her mother’s recipe down to me. Enjoy. Melt butter and brown sugar in a 21 cm (8-inch) square or round standard cake pan on top of the stove on low heat. Only use this size of pan for this recipe. Remove pan from stove and arrange the pineapple slices in the pan; add a cherry in each pineapple centre. Sprinkle nuts on top. Set aside. Preheat oven to 180º C (350ºF). Beat egg yolks in a large mixing bowl; add sugar and beat well. Add lemon juice and mix until well combined. In a medium bowl, sift together flour, baking powder, and salt, and add to first mixture. Beat egg whites until stiff and fold into batter; add vanilla and lemon rind. Pour batter over pineapple slices. Bake for approximately 30 minutes or until done. Cool for 3-5 minutes and turn over onto a serving plate.